This paper examines the aesthetic qualities of two animated feature films, Final Fantasy: The Spirits Within and The Incredibles, as a precursor to considering what issues are associated with the shift toward ‘ultra-realistic’ animation. The concept of realistic depiction of animated characters will be analysed within the context of Western culture with a particular focus on the notion of aesthetic engagement. How does a film such as Final Fantasy, clearly a technical triumph, suffer in comparison to the bright, burlesque qualities of The Incredibles? Shouldn’t the realistic aesthetic of Final Fantasy allow us to engage with characters to a greater extent? The commercial and critical success of both animated features will be evaluated in relation to Masahiro Mori’s theory of the Uncanny Valley. Although proposed over three decades ago, Mori’s theory of emotional responses towards robots and other non-human entities offers distinct application to contemporary animation studies, supporting the argument that today’s computer technology may indeed be no match for a well-crafted story and characters. Computer graphics entered the world of animation in the early 1980s, giving rise to the Computer Generated Images (CGI) revolution that followed. Disney employed their first computer graphics in The Great Mouse Detective (Walt Disney Pictures) in 1986 and Industrial Light and Magic (ILM) effectively designed a water creature in The Abyss (Lightstorm Entertainment, 1989). The Abyss was considered a visual breakthrough as the shimmering water tentacle emulated human qualities (Debra Kaufman, 1998). CGI and the introduction of digital actors continued to astonish audiences in Batman (Warner Bros. Pictures, 1989), Terminator 2 (Canal+, 1991) and Jurassic Park (Universal Pictures, 1993). By the 1990s, CGI matured its way into animation and ‘revolutionized the process of creating animated films’ (Jerry Beck 2004, p. 306). The success of Pixar’s Toy Story (Walt Disney Pictures, 1995), the first 3D animated feature released in 1995, marked a critical time in the history of animation production. CGI finally proved that it could be used for character animation (Rebecca Farley, 1998). The rapid changes in technology in the past decade contributed to the increasing image quality, setting new benchmarks for production houses such as Pixar, DreamWorks and Blue Sky studio. While the employment of 3D technology in animation can be perceived by some as a movement away from traditional methods of animation, the basic elements of existing 2D animation, such as timing, anticipation, follow-through and weight were still greatly utilized in 3D animated films. However, with the new capabilities of 3D rendering and 3D environment, animators began to aspire towards creating a realistic human motion and photorealistic aesthetics. Animation journalist Debra Kaufman (1998) argued that animators in the late 1990s focused heavily on ‘creating completely realistic digital creatures, including human beings.’ Notably, ultra-realistic 3D animation aimed at creating an illusion of reality can be quite convincing and animated characters nearly indistinguishable from real live actors. However, Bill Hilf (1997) points out that the arrival of CGI should be perceived as an aesthetic distinction rather than an evolution in the industry as the metamorphosis from traditional 2D animation to realistic 3D form is merely ‘an extension of an art form.’ Similarly, John Lasseter (1998) insists that the computer, similarly to pencil or clay, is merely another medium and that the most vital element remains to be creativity and imagination. For a number of years, one focus of 3D animators has been to reach the point where it is virtually impossible to distinguish between an animated character and live actor. In 1970 Japanese roboticist Mori proposed an idea he dubbed the ‘Uncanny Valley’ (Mori, 1970). 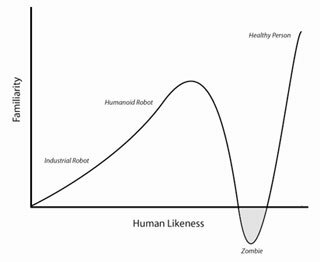 In this theory Mori perceived a phenomenon whereby the more lifelike a robot becomes, the more likeable they are, but only up to a point. Once they become too lifelike a sense of unease forms, frightening or repulsing us. In applying Mori’s theory to the advancements of 3D animation technologies and creation of ultra-realistic 3D characters, the question arises whether ultra-realistic imagery increases our engagement with characters or whether we have indeed reached the depths of the uncanny valley. To further examine the impact of these technologies that allow the creation of ultra-realistic animation and to evaluate the interconnections between ultra-realistic imagery and aesthetic engagement, two animated features will be analysed: Final Fantasy: The Spirits Within (Chris Lee Productions, 2001) and The Incredibles (Walt Disney Pictures, 2004). The theory of Uncanny Valley will then be applied to these two films to discuss whether audiences in fact become alienated by animated ultra-realistic imagery. Final Fantasy and The Incredibles were selected as a case study for two specific reasons. Firstly, Final Fantasy very clearly represents a benchmark in 3D animation, widely acknowledged as the first feature length animated film to aim for characters as realistic as possible. As a result it is often cited in critical analysis of animated film as well as discussion of animation technologies. The Incredibles on the other hand has been chosen as it offers a distinct counterpoint to the intentions of Final Fantasy. Although also displaying a mastery of animation technology, the aesthetic for its cast is very different to that of Final Fantasy. Concern may arise from the fact that The Incredibles was produced three years after the release of Final Fantasy. This however strengthens the further discussion. In this case it can be highlighted that The Incredibles made a conscious artistic decision in its specific aesthetic, even though the technology to create a more ‘realistic’ set of characters has already existed. Whilst wishing to acknowledge cultural differences affecting audience reactions and commercial success, the scope of this paper does not allow for the study of aesthetic engagement in diverse cultures, therefore limiting the evaluation of both feature animations to the context of Western culture. The plot of Final Fantasy is clearly inspired by the storylines of Japanese manga and anime. Set in the year 2065, the film tells the story of young scientist Dr. Aki Ross and her quest to save the planet from an invading race of aliens. In reality, the storyline however is secondary to the technical achievements on display. The most identifying characteristic of the film is in the animation style itself. Indeed, Final Fantasy is acknowledged in many instances as ‘far and away the most ambitious (and expensive) attempt to render realistic digital humans to date’ (Weschler, 2002). Although set in the future and in alien worlds, the filmmakers have achieved a frightening realism to the human characters. Dr. Ross in particular is presented with the flowing hair and skin blemishes of a real actress. This achievement came at a significant cost, with a spectacular array of technology being required to bring the characters to life. The power of this technology can be best summarised in a statistic provided by Dave Seager, Lighting Supervisor on the film. Seager suggests that the animation data all added up to ‘934,162 days of render time on one processor’ (Stokes and Ragan-Kelley, 2001). This figure illustrates that although extreme in its power and complexity, the technology now exists to create ultra-realistic animated characters, offering a previously unfeasible animation design aesthetic. The Incredibles focuses on a modern day superhero family. Bob Parr and his wife Helen are former superheroes trying to live a normal life, raising their three children. Bob however cannot let go of his past life of heroism, struggling with a job of exceeding tedium and immorality. When a mysterious organisation contacts him to play the role of hero again, the lure is too much, beginning a series of adventures for him, Helen and all three children. The overall aesthetic style of the characters of The Incredibles is distinctly different to that of Final Fantasy. Whereas Final Fantasy opted for ultra-realism, The Incredibles focused on caricature. To highlight both the individual personalities and personal conflicts of each character, their physical characteristics were exaggerated, with Bob Parr being the most obvious example. It may be argued that The Incredibles live in a world of superheroes, inherently leading to a more caricatured environment, however it should be noted that the world of Final Fantasy is one of aliens and spirit, not the ‘real’ world. The technology employed by The Incredibles consisted predominantly of Pixar developed specialist software, however commercial applications such as Shake, After Effects and Maya were employed. It must be noted however that although particular technological focus was placed on developing authentic muscles, skin and hair, as well as lighting effects, The Incredibles intentionally did not present these elements in an ultra-realistic aesthetic. Reaction to the two films can be judged in two distinct ways: Commercial and Critical. Although the advent of DVD sales has changed the dynamics, basic commercial success still relies on the very simple metrics of cost and box-office receipts in order to determine how well a film has performed. Figure 1 below provides a brief summary of the commercial performance of the two films. According to figures from IMDB, the total box office receipts for Final Fantasy totalled at US $85,131,830. When deducted from the estimated cost of production, Final Fantasy lost over $51 mil US, effectively bankrupting Square Pictures. In comparison, The Incredibles box office receipts were more than six times higher, with profits totalling over $444 mil US. These figures do not take into account a number of factors such as economic conditions and competition with other animated features in the marketplace. However, the difference in Net Profits is so significant that these factors do not undermine discussion. The box office figures for Final Fantasy strongly indicate a lack of positive reaction from audiences, a fact further supported by the overwhelmingly poor response from film critics. The Online Film Critics Society (OFCS), a professional international association comprised of film critics, historians, scholars and journalists, collates and presents reviews as well as providing an overall rating. According to OFCS, Final Fantasy rated at only 44%. This figure represents the approximate percentage of positive reviews of the film. While the reviews certainly criticized the poor quality of screenplay, simplistic plot and poor characterisation, a large number of critics also responded negatively to the film’s aesthetics. Given that Square Pictures set out to achieve a breakthrough in applying 3D technology to animation their goal quickly became one of their most significant downfalls. This sentiment was echoed by many critics, most eloquently expressed by Jason Vice: ‘Ironically, the film’s greatest strength is also one of its biggest weaknesses. As realistic-looking as the characters are, the flat, expressionless features make them seem emotionally aloof and rather unsympathetic’ (Vice, 2001). Other reviews go on to feature such terms as ‘puppet’ (Canemaker, 2004), ‘coldness’ and ‘mechanical’ (Travers, 2001), as well as ‘creepily artificial’ (Zacharek, 2001). In a similar contrast as presented by the box office figures, The Incredibles proved to be a great success with critics, with the OFCS rating the film at an astounding 93%. Reviews typically focused on the strength of the screenplay, however also touched on the distinct animation style. The film was complimented for its choice of ‘smooth, dynamic aesthetic’ (Chen, 2004), ‘warmth of its flatness’ (Zacharek, 2004) and realism of character’s emotions rather than their bodies (Byrnes, 2004). 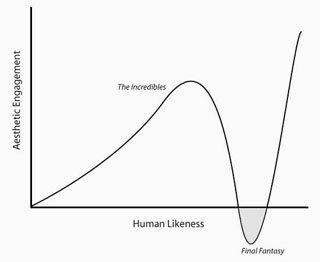 In comparison to Final Fantasy, The Incredibles appear to be driven by ‘distinct shapes and solid colors’ (Chen, 2004). The critical reviews underscored Pixar’s evident strategy in animating human characters, where they are not necessarily aiming for realism of their physical features. John Lasseter, Pixar’s chief creative officer, argues that ‘strong characters and a compelling story, rather than technological advances, are what make an animation project great’ (Lasseter 1998, p. 39). Therefore, it may be argued that the value of entertainment resides in the effective communication of ideas and in the personality of characters more so than in the technical mastery of reaching ultra-realistic characters. This notion can be investigated and supported from another perspective. Using the critical reaction as a starting point it can be seen that there is a clear suggestion of an aesthetic engagement taking place with the audience. Although the screenplay is a vital factor, it is evident that the aesthetics of both The Incredibles and especially Final Fantasy played a major role in how audiences respond to the films, thus this aspect of the production of animated films requires further analysis. The cases discussed in the previous section highlight an interesting conflict. As suggested, there are several issues that certainly play a strong role in the contrasting critical and commercial success of the Final Fantasy and The Incredibles. We propose that these can be grouped under the umbrella of ‘aesthetic engagement’. This idea of engagement in motion pictures and art is not new. Film theory suggests that narrative structures and themes are designed to tap into the emotions of the audience and provide a stronger emotional bond with the characters. However engagement is not generated simply from the emotional resonance of a screenplay. The cases discussed, particularly in the context of the reaction to the films, alluded to an aesthetic engagement that is taking place, possibly more strongly in animated features than in their non-animated counterparts. The notion of engaging with the visual elements of a film is not unique to animation. Indeed the Academy of Motion Picture Arts and Sciences present such visual awards in cinematography, visual effects and art direction to name but a few. Similarly the debate over choice of aspect ratio such as widescreen versus Panavision as well as the current ‘film versus digital’ indicates that aesthetic qualities of cinema are of the utmost importance. However it seems that a genuine aesthetic engagement is taking place in animated features and is being heightened by the trend toward ultra-realistic animation. Aesthetic engagement in animation can be seen to focus fundamentally on the appearance of the characters. Although the overall appearance of animated films (including backgrounds) contributes to the viewer’s level of immersion and depth of their cinematic experience, it can be argued that true engagement is primarily derived from the portrayal of characters. Researchers confirm that the animated version of reality needs to remain sufficiently abstract to allow audiences to employ their imagination and create unique bonds with characters. Winton (1998) insists that with animation, audiences do not ‘have to pretend that what they see is real. … All audiences have to do with animation is relate to the characters and their emotions’ (Winton, 1998 cited in Farley 1998, p. 67). With Hollywood producers opting for 3D computer animations over ‘traditional’ animation styles and with the ability to create ultra-realistic characters, examination of the function of aesthetic engagement in animation is becoming more critical. The application of Mori’s theory of Uncanny Valley to principles of aesthetic design in 3D animation may provide a better insight into why a cartoonish family of superheroes might be more engaging than an animated figure that looks just like you or I. In 1970, Masahiro Mori, a Japanese Robotics scientist, published a brief hypothesis regarding the emotional response to robot design as well as other non-human entities. This hypothesis was named ‘The Uncanny Valley’ and although containing obvious links back to the work of both Ernst Jentsch and Sigmund Freud in the early 1900’s, was a landmark observation on our emotional responses in general. Mori provided a figure charting our emotional response against our levels of familiarity, for both moving and still entities. Fig. 2 – The Uncanny Valley. Based on Mori, 1970. Figure 2 above shows that as the human likeness of an entity grows, so too does our level of familiarity. This familiarity can also be interpreted as our ‘engagement’ toward the entity. However, as can be observed in the dramatic dip, or the ‘uncanny valley’, the likeness reaches a point where it becomes quite disturbing. This can be understood as the point where the likeness is so close to human, yet with enough variation, that it is the differences that suddenly become prominent. It is obvious that the Uncanny Valley principle has connotations reaching outside the domain of robot design. Canemaker (2004) suggests that ‘as a visit to Madame Tussaud’s proves, masses of highly specific visual information don’t necessarily result in a higher degree of believability – in fact, the results can be downright creepy.’ Although not specifically referencing Mori’s Uncanny Valley, the links are undeniable. It is only in the past few years that the association of the Uncanny Valley with filmmaking has been made. Indeed, the reaction to Final Fantasy in Western culture has been a major part in drawing this connection, particularly to the animation context. It is apparent nonetheless that as the technology is developed for animation to reach a level tantalisingly close to reality, the concept of the Uncanny Valley becomes increasingly relevant. Brad Bird, director of The Incredibles also indirectly raises the Uncanny Valley concept. In a piece in Computer Arts Bird states: ‘The character design was difficult. … CGI looks plastic without detail, but beyond a certain point with the stylised deformed people, it starts to look creepy’ (Computer Arts, 2004). The notion of aesthetic engagement again arrives at the fore. Filmmakers’ concerns about the appearance of their lead characters revolve largely around possible levels of audience engagement. Critics turn to descriptions such as ‘distinctly unpleasant’, ‘eerie’ and ‘grotesque’ rather than simply acknowledging that audiences may find the characters unrealistic. Contrasting these problems is the example set by The Incredibles. ‘They are cartoonish, yet completely acceptable as living, breathing, flawed humans with a range of feelings and problems’ (Canemaker, 2004). Whilst the aesthetic design of The Incredibles does not exhibit ultra-realism, engagement with these characters is indeed partially generated by identifying with their physical attributes. Parents relate to Bob Parr, the father of the family of superheroes, mostly due to his appearance as a caricatured overweight and down-trodden middle-aged man in an unfulfilling job. Teenagers can identify with Bob’s daughter Violet because she is a cartoon representation of the typical ‘outsider’ in high school, complete with ‘alternative’ look and nervous disposition. If these characters were designed to look as close to realistic as the technology would allow, then rather than empathise, audiences may be concerned that Bob’s large belly wobbled too much, or that Violet’s doe-eyes were scarily large. As a result, Mori’s theory of the Uncanny Valley can be directly applied to the realm of 3D animation in considering the notion of aesthetic engagement in animated features. Indeed, Mori’s original figure for charting our response to human likeness can be adapted to focus on engagement rather than familiarity. I can’t help gravitating toward the warmth of its flatness. But Bird and his team pay close attention to details – fabric, hair, the texture and tone of skin – and take great care to make sure nothing is too creepily hyper-realistic. (2004). It is also argued that ultra-realistic (or photorealistic) animation offers no visual space for viewers to engage their imagination in order to form a unique experience. Phaedra Riley (2005) suggests that ‘by selectively focusing on the details of movement and gesture over true-to-life reproduction, animators create a stronger emotional bond with their audiences by allowing people the visual space to enrich the animation with their own experiences.’ The essential elements of animatronics such as anthropomorphism and emotional projection are vital for an animated film to successfully interact with their audiences and to evoke empathy. Arguably, it is here that ultra-realistic animation also fails in establishing strong emotional connection. Figure 3 is not intended to detail a definitive explicit relationship between engagement and human likeness, but rather to apply Mori’s ideas into the animation context, particularly that of 3D animation. Now that the technology exists to achieve animated characters that are ultra-realistic in their physical characteristics, this paper aims to elevate awareness of the role that character aesthetics play in engaging audiences of animated cinema. Is this to mean we must shun technical advancement in the realm of 3D animation? Certainly not: The Incredibles has already proven otherwise as an example of technical mastery with consideration for an aesthetic engagement. It is clear that in an age of computer-driven technical advancement in animation, physical realism of animated characters can be achieved. Animated films have embraced this heightened realism, arguably culminating in the release of Final Fantasy. However, the realm of ‘uncanny’ realism employed in this animated feature also demonstrates how the notion of aesthetic engagement may be reversed. While limiting this study to the context of Western culture, the application of Uncanny Valley theory to animated films strongly contributes to the discussion that aesthetic engagement indeed represents one of the major elements that enables animation to remain such a charming and timeless art form. It becomes evident that aesthetic designs of ultra-realistic 3D animations provide audiences with limited opportunities to employ their imagination and to generate strong emotional interaction with characters. The speculations how digital photo-realistic actors would revolutionize filmmaking continue to fade while animators are returning to the essential elements of animatronics such as anthropomorphism and emotional projection. If one of the main purposes of animation is to make our audiences laugh, cry, and feel for the characters, then the goal should be the peaks and not the troughs of the uncanny valley. Beck, J. (2004). Animation art : from pencil to pixel, the history of cartoon, animâe and CGI. New York, Harper Design International. Farley, R. E. (1998). ‘Play and Transformation: The Animated Aesthetic.’ Department of English. Brisbane, University of Queensland. Masters of Arts, English, p. 151. Kaufman, D. (1998). Animation Journalist. Animation 101. E. Pintoff. Studio City, CA, Michael Wiese Productions. Lasseter, J. (1998). Computer Animator and Director. Animation 101. E. Pintoff. Studio City, CA, Michael Wiese Productions. Mori, M. (1970). ‘The Uncanny Valley.’ (K. F. MacDorman & T. Minato, Trans. ), Energy 7(4), p. 33-35. Riley, P. (2005). ‘Animate Pillow Project’. Tisch School of the Arts. New York, New York University. This entry was posted in Matthew Butler & Lucie Joschko - Final Fantasy or T and tagged Final Fantasy, The Incredibles, uncanny. Bookmark the permalink.